But as the pastor's daughter raised behind the Iron Curtain just won a fourth term at the helm of Europe's biggest economy, many Germans simply call her the "eternal chancellor". Berlin: Angela Merkel has been derided as Europe's "austerity queen", cheered as a saviour by refugees and hailed as the new "leader of the free world". "Mutti" (Mummy) Merkel, with her pragmatic, modest and reassuringly bland style, has perfected the art of staying in power in a wealthy, ageing nation that tends to favour continuity over change. If there is one conviction Merkel holds dear, it is a lesson from her upbringing in communist East Germany -- a firm belief that Germany and Europe must stay competitive and debt-free in a rapidly changing global economy. When international newspapers, after Trump's surprise victory last year, declared Merkel the new torch-bearer of liberal democracy, she waved off the accolade as "grotesque and absurd". Though frequently criticised for sitting out tough challenges, Merkel has punctuated her reign with bold and surprising decisions -- from scrapping nuclear power after the 2011 Fukushima disaster to opening German borders to more than a million asylum seekers since 2015. But as the number of new arrivals eased off and her government pushed through tougher asylum policies, her poll ratings edged back up to pre-crisis levels. Merkel herself usually refuses to mention her rivals by name or engage in spirited political dialogue, which lent a slightly dreamy atmosphere to the election campaigns and infuriated her shadow-boxing opponents. Martin Schulz, her temperamental challenger, lashed out in June, labelling Merkel's apparent tactic of keeping politics as unexciting as possible "an attack on democracy" -- a comment that earned him stern rebukes from legions of the chancellor's supporters. Der Spiegel's Alexander Osang recently labelled her the "woman in amber", as impenetrable "as a sphinx, diva or queen", whose speeches were akin to "mass hypnosis". Like most students, she joined the state's socialist youth movement but rejected an offer to inform for the Stasi secret police while also staying clear of risky pro-democracy activism. During that momentous upheaval, Merkel joined the nascent Democratic Awakening group, which later merged with the Christian Democrats (CDU) of then-chancellor Helmut Kohl, who fondly if patronisingly dubbed Merkel his "girl". But Merkel's mentor was not the last politician to underestimate her and pay the price. 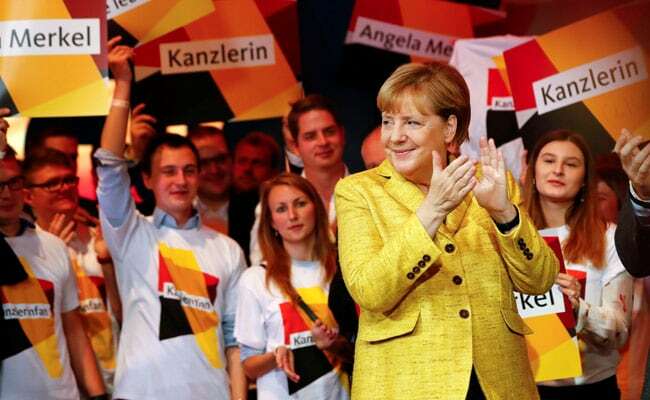 The move, which has been described as "Merkelvellian", kicked off her meteoric rise. As an outsider, she remade the CDU, anchoring it in the political centre by pushing progressive social policies, abolishing compulsory military service and scrapping nuclear power. She emerged as Europe's go-to leader during the debt crisis, though she was derided as a puritanical "austerity queen" in the worst-hit southern countries. As she starts her fourth term, there is no challenger in sight, but plenty of challenges ahead for Merkel, whom New Yorker magazine just labelled "the most powerful woman in a world filled with unstable men".